Long before home buyers decide a certain place must be theirs, it behooves them to ask a lot of questions. For example: “How’s the neighborhood?” or “How old is that water heater, anyway?” Ask away! Such queries help you pare down your options, so don’t be bashful; real estate agents have heard them all. However, the adage “There’s no such thing as a stupid question” isn’t always true. 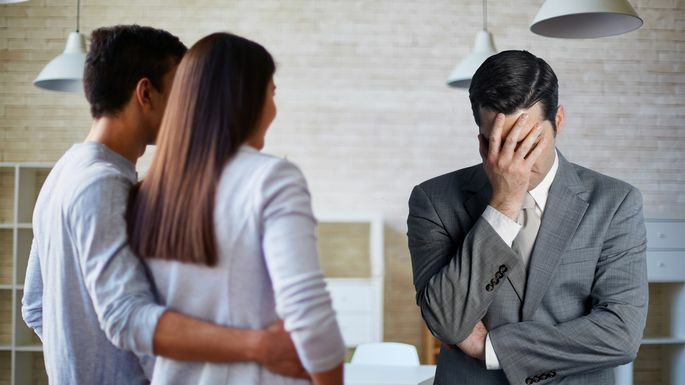 As proof, just check out this list of the strangest questions real estate agents have ever heard about a house. Cue the “Twilight Zone” music—things are about to get very, very weird. “They said they were swingers and that’s something they were looking for,” she said. Unsure what to say, she countered with, “drive around the neighborhood and see.” After all, aren’t swingers very friendly? Chike Uzoka, a real estate agent with Weichert in Newark, NJ, has heard of buyers asking whether many things “come with the house,” from chandeliers and furniture to appliances and pool equipment. But a car? When Chris Dossman, a real estate agent with Century 21 in Indianapolis, holds open houses at older homes, it’s not uncommon to hear creaks or creepy noises. That prompts a superstitious few to pop the ghost question. “I thought the would-be buyer would go home and pray about it and then decide, so I said ‘sure. '” That’s when things got weird. The buyer went on to explain that he’d taken a seminar on how to get the seller to deed the buyer the property without any credit or money. The question threw Pate Stevens for a loop, but then he figured there was no harm. “Although a strange request, I drove over to the home at midnight to let him in,” said Stevens, a real estate agent with Nourmand & Associates, in Beverly Hills, CA. “When I heard that question, I thought, ‘This is going to be a long tour,'” Kang said. By Daniel Bortz – Daniel Bortz is a Realtor in Maryland, Virginia, and Washington, DC, who has written for Money magazine, Entrepreneur magazine, CNNMoney, and more. ← 110 Woodland Ave – Closed! !